Outgoing Arizona Republican Sen. Jeff Flake waded into the controversial U.S. Senate race. So this happened: Arizona Republican Sen. Jeff Flake gave a check to a Democrat. To be precise, to Doug Jones. Jones is the Democratic candidate for Senate from Alabama. So what's the big deal? It's just a hundred bucks. But it's a statement. Jones' Republican rival in that race is Roy Moore, who's accused of sexual assault in a race that has — at least outside of Alabama — caused rifts within the GOP. President Donald Trump supports the embattled Republican — ultimately endorsing him on Monday — whereas high-profile congressional leaders, like Senate Majority Leader Mitch McConnell, have called on Moore to exit the race. As for Sen. Flake, his position is clear. That check had the words "Country over party" in the memo line. Though it's not like that's a particularly risky position for Flake to take so publicly. Earlier this year, he announced a sudden decision not to seek re-election. That was after a period of high-profile disagreements with President Trump. And that obviously hasn't changed. Just last month, our sister station KNXV in Phoenix caught a hot mic moment with the outgoing senator lamenting the state of his party. 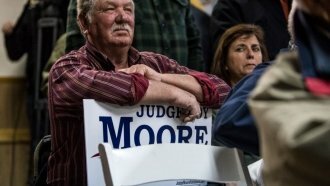 Voters make their choice between Moore and Jones next Tuesday.